Newsletters and some meeting presentations are available to anyone at no charge, and no password is required. Journals and some meeting presentations are available to WCGS members only, and a password is required. If you are a member of the society and need the password, please contact Membership. To learn more about our award winning Wake Treasures journal visit the Journal page. Adobe Reader is needed to view and print the PDF files on this page. If you have trouble downloading and opening the documents, try using the latest version of Microsoft Internet Explorer. Free issues of Wake Genealogy Watch, our present newsletter, may be downloaded at the WCGS Newsletter page. In addition copies of the award-winning WCGS Updates for years 2000-2016 may also be accessed for download. Indices are a great finding aid to help in identifying materials of interest. To download an index for your review, click on one of the titles below. This WCGS publication can be purchased from the WCGS Lulu Store through the link in the section below. This is an index to the journal's volumes 1-25. Journals may be downloaded by members in the members-only area. Non-members may purchase issues of the journal from the WCGS Lulu Store. Several of the presenters at the monthly Wake County Genealogical Society meetings have kindly agreed to make their presentations available. To download a presentation, click on the title. Deeds sometimes are the only records surviving to let us know our ancestor lived in a given place. They also may provide the proof needed to link parents to their descendants. 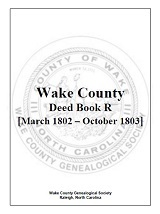 Deed Book R is the earliest extant deed book for the county. Only portions of some of the earlier deed books exist. This publication covers the entire original volume. Deed Book R may be purchased at the WCGS Lulu store. These records can include wife’s maiden name, marriage date and place, existence of children, and names of extended family members or neighbors as witnesses. 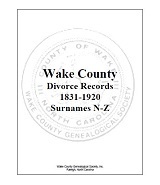 Divorce Records N-Z may be purchased at the WCGS Lulu store. Levy Dockets are a special case of land records wherein an individual’s property has been seized and subsequently sold by the sheriff in order to pay an estate debt, unpaid taxes, or other similar debt. Items in these dockets may include warrents, judgements, attachments, and executions on the property. Levy Dockets may be purchased at the WCGS Lulu Store. 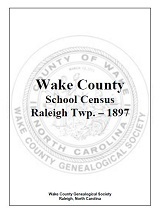 If you have Raleigh ancestors around the turn of the century, you may be interested in the volumes of school censuses for the township. This publication contains the 1897 census for white students. Ages of the students and, in some cases, the street of residence is also shown. The 1897 School Census may ne purchased at the WCGS Lulu store. by the Wake County Genealogical Society, Inc. 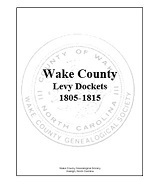 This book is an excellent compendium that includes an overview of Wake County History as well as family overviews as submitted by the community! It is the most... More > requested book ever for Wake County Genealogy Research! The Heritage of Wake County may be purchased from the WCGS Lulu Store. A free index is available for download. 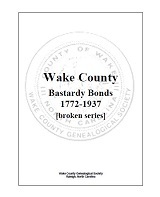 by Wake County Genealogical Society, Inc.
For the first time ever, abstracts of all extant Wake County (NC) Apprentice Bonds are available in one place! Learn who was apprenticed to whom to do what for how long in this fascinating look at this 18th and 19th century practice. Wake County Apprentice Bonds may be purchased from the WCGS Lulu Store. Divorce records can contain a wealth of information -- wife's maiden name, marriage date and place, the existence of children, may mention extended family and/or neighbors as witnesses and so much more! Don't overlook these often detailed records as you research Wake County families. 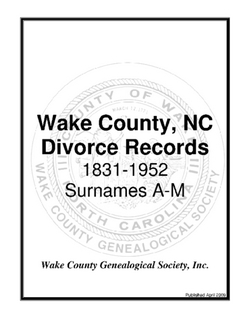 Wake County Divorce Records may be purchased from the WCGS Lulu Store.